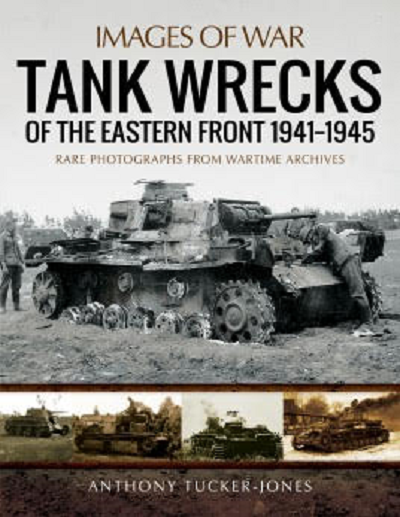 ​Four years of armored battle on the Eastern Front in WWII littered the battlefields with the wrecks of destroyed and disabled tanks, and Anthony Tucker-Jones's photo history is a fascinating guide to them. It provides a graphic record of the various types of tank destroyed by the Red Army and the Wehrmacht during the largest and most destructive confrontation between mechanized armies in military history. During the opening stages of the war, the German victors regularly photographed and posed with destroyed Soviet armor. Operation Barbarossa left 17,000 smashed Soviet tanks in its wake, and the heavy and medium tanks such as the T-28, T-35, KV-1 and the T-34 proved to be the source of endless interest. Once the tide turned the wrecked and burnt-out panzers - the Mk. IV's, Tigers and Panthers - were photographed by the victorious Red Army. The book is soft-cover of 141 pages in 7 1/2" x 9 3/4" page format. The cover shows a knocked out German Pz.Kpfw. III photo over 3 smaller photos of other knocked out tanks. These 3 photos are too inky to make out the types. Plus a listing of other similar books. I want to thank the folks at Casemate Publishing who sent me this review sample and the folks at Pen & Sword publishing.